This article is about Musselburgh in Scotland. For Musselburgh in New Zealand, see Musselburgh, New Zealand. Musselburgh (/ˈmʌsəlbərə/, Scottish Gaelic: Baile nam Feusgan) is the largest settlement in East Lothian, Scotland, on the coast of the Firth of Forth, 5 miles (8 km) east of Edinburgh city centre. The population of Musselburgh is 21,900. The name Musselburgh is Old English in origin, with "mussel" referring to the shellfish, and "burgh" derived from the Old English for "town". Musselburgh was first settled by the Romans in the years following their invasion of Scotland in AD 80. They built a fort a little inland from the mouth of the River Esk, at Inveresk. They bridged the Esk downstream from the fort, and thus established the line of the main eastern approach to Scotland's capital for most of the next 2,000 years. The bridge built by the Romans outlasted them by many centuries. It was rebuilt on the original Roman foundations some time before 1300, and in 1597 it was rebuilt again, this time with a third arch added on the east side of the river. The Old Bridge is also known as the Roman Bridge and remains in use today by pedestrians. To its north is the New Bridge, designed by John Rennie the Elder and built in 1806. This in turn was considerably widened in 1925. The Battle of Pinkie Cleugh was fought south of Musselburgh. Musselburgh is known as "The Honest Toun", and celebrates this by the annual election of the Honest Lad and Lass. The town motto "Honestas" dates back to 1332, when the Regent of Scotland, Randolph, Earl of Moray, died in the burgh after a long illness during which he was devotedly cared for by the townsfolk. His successor offered to reward the people for their loyalty but they declined, saying they were only doing their duty. The new regent, the Earl of Mar, was impressed and said they were a set of honest men, hence "Honest Toun". The town and its population grew considerably throughout the latter half of the twentieth century, with major local authority and private housing developments on both the eastern and western outskirts. Before 1975, Musselburgh was part of Midlothian, not East Lothian. It became part of the East Lothian District following the Local Government (Scotland) Act 1973 and subsequently East Lothian unitary council area in 1996. Schools include Loretto School, a private boarding school, and Musselburgh Grammar School, the local large comprehensive that is one of the oldest grammar schools in the country, dating from 1608. Primary schools include: Campie Primary School, Musselburgh Burgh Primary School, Stoneyhill Primary School, Pinkie St Peter's Primary School, Loretto RC Primary School and Loretto Nippers (private). Early learning locations (ages 3–5) include The Burgh, Stoneyhill, Loretto RC, and St. Ninian's. There are also several private nurseries for preschool-aged children. Edinburgh's Queen Margaret University relocated all its schools from Edinburgh to Musselburgh as of 2007[update]. Her Majesty The Queen officially opened the QMU campus in July 2008. Musselburgh is served by two railway stations. Musselburgh railway station is in the west of the town adjacent to Queen Margaret University and has regular Abellio ScotRail services from Edinburgh Waverley to North Berwick. It is a relatively new station, having opened in 1988. The other station serving the town is Wallyford railway station to the east of the town in the village of Wallyford, which opened in 1994. The town's original station was close to the town centre at the end of a short branch from Newhailes Junction. Passenger services from there ceased in 1964, and the line closed to all traffic in the early-1970s. The former railway line is now a road bypassing the Fisherrow area of the town. The A1 by-passes the town and meets the A720 Edinburgh City Bypass at the edge of the town before continuing to Edinburgh city centre. The A199 goes through the High Street to Edinburgh in the west and to Dunbar to the east. This was originally the A1 until the town's bypass was built in the mid-1980s. The Musselburgh Silver Arrow is reputed to be the oldest sporting trophy in United Kingdom, and is competed for annually by the Royal Company of Archers. It dates back to at least 1603. Musselburgh is home to both Musselburgh Racecourse and Musselburgh Links golf course. The links, a former venue of golf's Open Championship, have recently been acknowledged as the oldest continuously played golf course in the world. Musselburgh Athletic F.C. are the town's junior football team playing in the Scottish Junior Football at Olivebank Park to the west of the town. Musselburgh also boast some of the best grassroots teams for young players e.g. Musselburgh Youngstars. Musselburgh RFC play in the BT National League 1 at Stoneyhill. The Musselburgh Roads Cycling Club was formed in January 1936 by a breakaway group of 16 from the Musselburgh Clarion. After forming an alliance with other clubs in during the war, The MRCC reformed again in its own right in January 1945. The club has a long and successful history of competitive cycling. Jock Allison who in 1945 won the British Best All Rounder title, to date still the only Scottish club rider to do so. Janet Sutherland who dominated Scottish woman’s cycling in 1951-4. Sandy Gilchrist who in 1977 won 5 individual and 4 team Scottish Championships. Many other riders from the club have won National Championships or been selected to compete at World Championship level or the Commonwealth Games. Today, Club Members take part in track racing, road racing, time trials, cyclo cross and mountain biking. Their base is at the Tolbooth in the High Street. There is also a locally run darts league, the Musselburgh and District Darts League, comprising an A and B league, each containing eight teams. Many players from this league represent the Lothian team at county level. In Musselburgh there is also an amateur swimming club called Musselburgh Amateur Swimming Club. The club is home to the Musselburgh Marlins and trains at Musselburgh Sports Centre. The members of the club vary in ages from 6 all the way up to adults. The club is very inclusive in the community and was first established in 1886 and in its current format in 1994 where they trained at Loretto Swimming Pool which is now closed. The East Lothian Seagulls of the Scottish Floorball League are based in Musselburgh and train and play matches at the sports centre at Queen Margaret University. James Martin (Scottish actor) Best known for his role as Eric in Still Game. According to his autobiography, Sir Harry Lauder's parents lived at Musselburgh after he was born, and Harry's brothers Matthew, John, and Alexander, and a sister, Isabella, were all born there. Giuseppe Manca - World renowned painter and decorator. 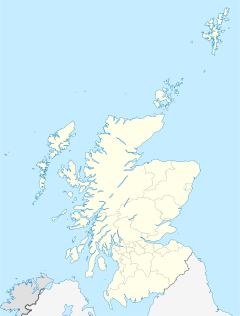 Musselburgh is twinned with Champigny-sur-Marne (France) and Rosignano Marittimo (Italy). ^ "Musseburgh". National Place-Names Gazetteer. Ainmean-Àite na h-Alba. Retrieved 22 October 2011. ^ "Musselburgh". East Lothian Council. 20 November 2008. Retrieved 4 March 2015. ^ Musselburgh was famous for the mussel beds which grew in the Firth of Forth; after many years of claims that the mussels were unsafe for consumption, a movement has been started to reestablish the mussel beds as a commercial venture. ^ "Links play out onto record books". BBC News.co.uk. 2009-03-17. Retrieved 2009-03-18.